Reviewed by Brian McGowan and released by Spinefarm Records in April 2017. Arguably, Michael (Monkees) Nesmith was the first artist “to mix the swagger of country with the power of rock” on his First National Band debut, Magnetic South, back in 1970. In the 47 years since, many artists have attempted to straddle that frequently blurry dividing line, losing their balance and their credibility in the process. Even harder to walk the line now when the country it represents has shifted and evolved, as real rock fans sit it out behind locked doors with their vinyl collection, waiting for better days. 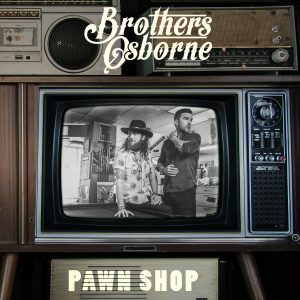 What never changes is the notion that the best country music sounds like the artist has downloaded his emotions onto the recording you’re listening to, and the usual country themes – blue collar values, love, heartbreak and patriotism – resonate loudly on Pawn Shop. Lives of borderline poverty, lived within limited horizons are inevitably examined – ‘Dirt Road’ and the title track itself, scratchy and catchy, are dark visions of reality, both painted in compelling imagery and twanging, rattling, lofi arrangements. Producer, Jay Joyce, is clearly happy to usurp genre conventions, mixing traditional country arrangements with pop and rock tropes, building every track from the ground up, beginning with simple strums and a rattling tambourine, climaxing with a full gloss and polish. On cute, crowd-pleasing pop-crossover, ‘Stay A Little Longer’ (selling over 600,000 singles in the USA) he throws off the country straitjacket with smiling abandon, shoehorning in some sweet’n’funky axe soloing as the song crosses every genre boundary on its way to a satisfying payoff. Equally, the conventional ingredients of muted horns, lap steel guitar and country choir provide just the right tone of melancholy to ‘Loving Me Back’, letting T.J. Osborne’s husky drawl and guest Lee Ann Womack’s yearning vocal wring every last drop of pathos from a deceptively simple lyric. But underneath it all, when you strip away the veneers, the music’s often palatial architecture is underpinned by the brothers’ undeniable gift for writing a memorable tune. So much so, the label has seen fit to reissue this 2015 album with 3 bonus tracks. The bittersweet ‘Love The Lonely’, spaghetti western tribute, ‘Shoot From The Hip’ and the truly immense, Springsteen-esque ‘Arms Of Fire’. They conspire with the preceding tracks to create an album of outstanding popular music. As Alan Kay once said…”prediction is very difficult, especially when it’s about the future” … still, we predict great things for this duo.